The impressive landscape surrounding the Blausee was formed by a rockslide 15,000 years ago. The water, rich in minerals, turns the lake a deep blue and gives it its name. The lake has become a tourist destination en route to Valais since the 19th century. 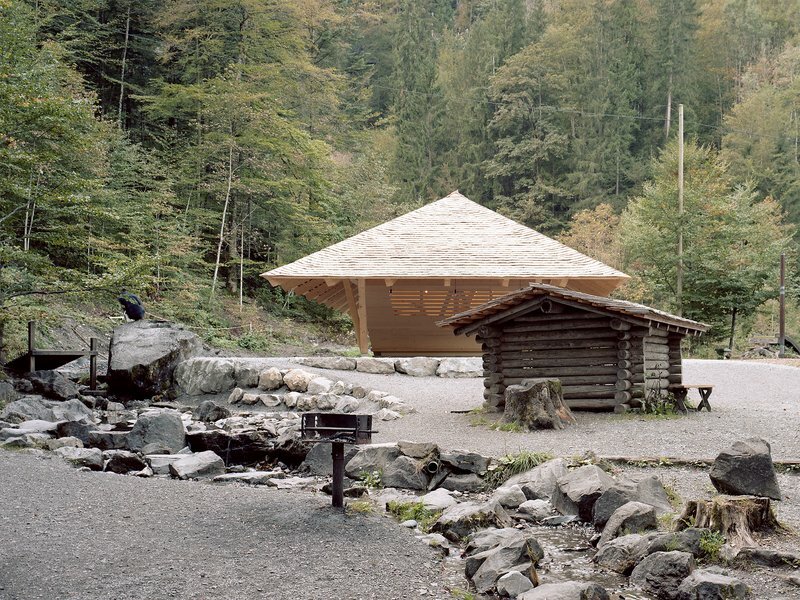 The wooden pavilion is perfectly embedded in the poetic landscape and carries forth the efforts to make the Blausee a popular tourist attraction without succumbing to nostalgia – even despite being inspired by the archaic image of the large protective roof, familiar from the traditional Bernese farmhouses. Three layers of wooden shingles, which remain visible from the interior, cover the sweeping roof, and neither roof lights nor sanitary pipes penetrate its compact construction. There is furthermore no gutter so that a sparkling curtain is formed by the falling water drops along the edge of the roof on a rainy day. The roof is made of local pine and was built by local craftsmen; the shingles, for example, were made by one of the last remaining shingle makers in the Bernese Highlands. The special layering technique, originally from Fribourg, articulates a broken instead of a sharp ridge to strengthen the construction and enhance its longevity: every fifth row changes direction in order to break the speed of the rainwater flowing down the roof. All these elements make the roof construction more sustainable and give it its organic appearance. The collaborations with local craftsmen and their know-how not only influenced the design and appearance of the building but led to fruitful teamwork and a strong identification with the building by the local population. The role of architecture and its influence on the continuation of a building culture rooted in local traditions is one of the main challenges of our time and had to be addressed even in such a small project as this pavilion at the Blausee. How to combine high tech with low tech while keeping the human scale at the centre of the design and still appealing to all of our senses remains at the core of all architectural endeavours.